The morning hospital report on Metro was okay, but not great. He is up to “the high 140 grams” based on the doctor’s memory; the chart was not available. That’s up from 139g yesterday morning. But, he’s still weak on sucking so they are feeding him both by tube and bottle. Every hour, apparently. Last night’s and this morning’s doctors advised against a family visit. Yesterday morning’s doctor and our regular vet said we should see him and bring his mother or at least a towel with her smells on it. We are trying to follow doctor’s orders, but we didn’t know we needed to run an opinion poll to find out what the orders are. MUNI had her first moments of behavioral cuteness today. When I was leaning into the whelping box to pet and cuddle Zenith, MUNI crawled up between my arm and Zenith, snuggled up a bit to both of us, and then let loose a distinct satisfied sigh. She’s doing well on the statistical side, too. She’s up to 10.5 ounces, growing more than the 10% a day target. Zenith is somewhat less fussy than she’s been other days, although she still isn’t eating dependably. Yesterday she ate two good meals of mostly cottage cheese and boiled chicken, and she a huge dinner (1/3 can of rich Science Diet Urgent Care food and some cottage cheese). She wasn’t really very hungry for breakfast, though. She only picked at the wet dog food. So, Zenith is hit or miss, but she seems to be liking the coddling and extra care. Zenith has also interacted more today with the rest of the pack. She hung out with them while breakfast was readied, and she also did some happy jumping on SeQueL and Paris (Apex is too fast to be jumped on). Now, I’ll post this report and go in to the WARM puppy room to do some work. 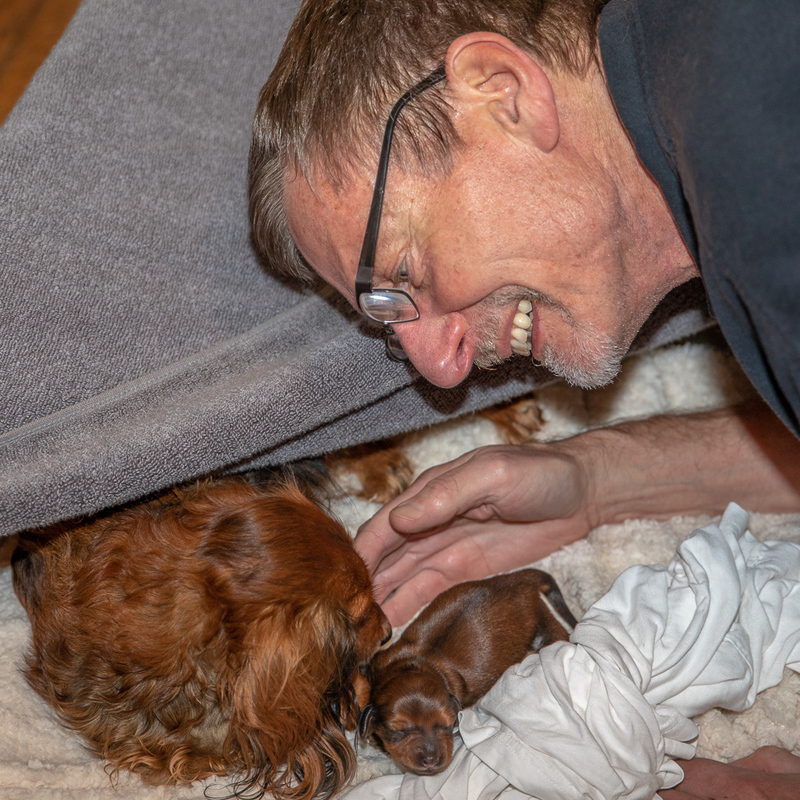 This entry was posted in dachshunds and tagged Metro, MUNI, puppies, puppies2018, whelping. Bookmark the permalink.